Rossie has filed an application at the High Court seeking an order to compel the government, police and the Parirenyatwa Group of Hospitals to release her late husband’s post-mortem report. She is demanding US$610 000 from the Ministry of Defence arguing army personnel detained and killed her husband. Rossie filed the application on Wednesday through her lawyer, Denford Halimani of Wintertons Legal Practitioners. Munetsi died on November 15 2017 at the age of 55 at the height of the military coup that toppled Mugabe after 37 years in power. In her application, Rossie says she was forced to approach the courts for recourse after exhausting all other avenues. She also argues she was running out of time to get the post-mortem in her quest to get her husband’s insurance, pension as well as other benefits. Rossie says she has suffered trauma as a result of her husband’s brutal killing and believes the post-mortem, which establishes how her husband died, will bring closure to her and help her resolve benefits access problems. Commissioner-General of Police Godwin Matanga, Home Affairs and Culture minister Cain Mathema, Parirenyatwa Group of Hospitals and pathologist Tsungai Jabangwe are cited as the first, second, third and fourth respondents respectively. While government claimed the coup was bloodless, Rossie claims in her founding affidavit that the concerned post-mortem, which is being withheld from the Munetsi family, indicates that the former spy agency’s district divisional intelligence officer died as a result of brutal assault. “On 1 October 2018, the Zimbabwe Lawyers for Human Rights (ZLHR) wrote another letter to the third respondent (Parirenyatwa Group of Hospitals) advising them of our intention to meet the Officer-in-Charge of the Parirenyatwa Police Post in relation to the post-mortem report. The meeting took place as scheduled and my legal practitioners managed to go through the post-mortem report. The post-mortem revealed that my husband’s death was caused by intra muscular bleeding and blunt force trauma as a result of assault. Regrettably the investigating officer was not able to attend the meeting and hence the report was not actually collected from the police post,” reads part of the application. “I require the post-mortem report so as to ascertain the official cause of my husband’s death and to forward the report to insurers who require it as a pre-condition to redeem my late husband’s EcoSure funeral insurance policy. I also require it as evidence in the civil claim that I intend to institute against the wrong-doers. Thus I require the post-mortem report for the exercise or protection of a right as contemplated in Section 62(2) of the constitution,” she says. According to the application, Munetsi died at One Commando Barracks after “unlawful assault”, whilst in military detention on November 15, 2017. He was attended to and certified dead by Jabangwe. Rossie says the Zimbabwe Republic Police are holding the post-mortem report and have been evasive when asked to produce it. “Depending on who you are talking to the responses from police have ranged from feigning ignorance about the post-mortem report to confusion about its whereabouts or discomfort expressed in murmurings about the nature of the case,” she says. Munetsi’s death is being investigated by CID Homicide at Harare Central Police Station, but Rossie says “no meaningful investigations have taken place to arrest the perpetrators as the second anniversary of my husband’s death draws nearer”. She says police’s inaction has forced her to approach the court in desperation. “I have exhausted all reasonable non-litigious avenues to obtain the post-mortem report without resorting to this honourable Court. However, time is running out for me. I could lose the right to sue if three years pass by without taking any legal action. At the same time, I cannot take legal action without being in possession of the post-mortem report,” she says. “Further, without the post-mortem report, I cannot redeem my husband’s insurance policy, death on duty benefit and pension. I am stuck. The post-mortem report is crucial in my endeavours. I need closure as well. The longer this drags on the more I continue to relive and be haunted by my husband’s wrongful death. The economic down-turn is eating into the value of whatever amount I am entitled to. I am suffering irreparable prejudice. 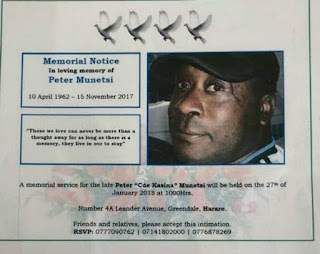 “During his lifetime, Peter Munetsi owed a legal duty to his wife and his gross monthly income was US$4 797,64 calculated as follows: Monthly pension of US$1 734.80 in terms of section 5 (7) (a) of the State Service (Pensions) (Ununiformed Forces) Regulations 1976. Salary form the Central intelligence organisation of US$3 059,84 per month from a yearly renewable contract, tenable for 10 years,” the letter which is attached to the High Court application reads. “It follows that the late Peter Munetsi’s wife is entitled to damage for loss of support in the amount of US$605 955,20, being the total of his gross income over a 10-year period. Additionally our client was severely traumatised by the death of her husband and currently requires medical care and attention to deal with the emotional shock of losing her loved one in such a brutal manner. In a response to the correspondents by ZHLR dated, May 8 2018, the Defence Forces of Zimbabwe denied having a hand in Munetsi’s death. “Whilst we acknowledge that the late Peter Munetsi died whilst in custody, the cause of death is disputable. What we know is that he was on several medications for chronic illness. In respect of support to the family, we are reliably informed that he is on full pension from his then employer. 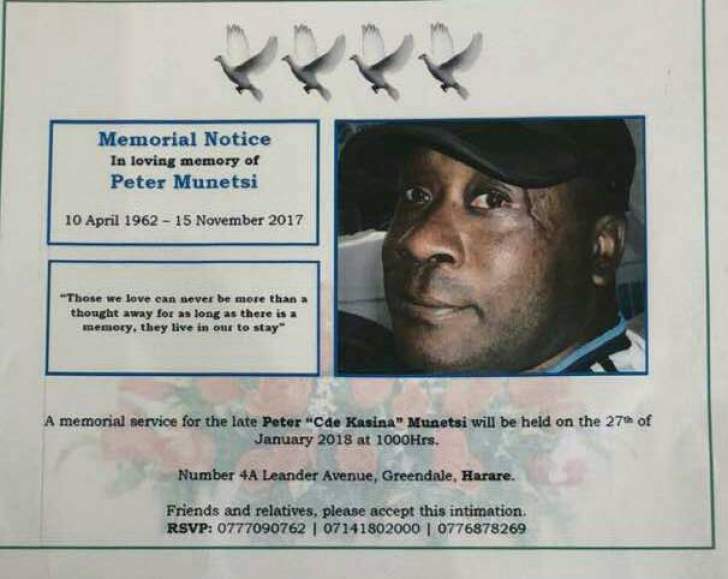 No liability for compensation can be apportioned as circumstances of the death of Peter Munetsi cannot be other than illness,” the letter signed by Judge Advocate General Charles Tarumbwa reads. Rossie says she has locus standi to make the application as Munetsi’s surviving spouse and beneficiary of the deceased’s estate.